The River Hodder is a major tributary of the River Ribble in Lancashire. It drains an area of 261km2, much of it within the Forest of Bowland Area of Outstanding Natural Beauty. 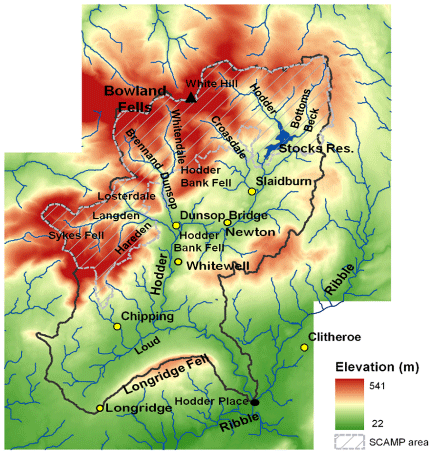 The headwaters of the Hodder rise on the Bowland Fells, a landscape which is characterised by steeply incised valleys and plateaux covered with rough moorland and blanket peat mire. The highest point in the catchment is White Hill, which has its summit at 544 mAOD. These upland areas have rich organic soils supporting grassland and moorland vegetation, and receive high annual rainfall totals (on average in excess of 1500mm per year). Their land use dominated by livestock farming and game rearing. Stocks Reservoir is a major feature in the upper catchment, with a surface area of 1.9km2. Opened in 1932, it is now managed by United Utilities and provides drinking water to Preston, Blackburn, the Ribble Valley and the Fylde. The reservoir is fed by the Upper Hodder and Bottoms Beck, as well as a number of smaller streams. On its progression southwards towards the Ribble, the Hodder is joined by a number of its own tributaries including Croasdale Brook, Easington Brook, the River Dunsop (including sub-tributaries the Brennand and Whitendale), Langden Brook and the River Loud. In the lower Hodder valley and within the River Loud catchment mineral soils support improved grassland, making the area more favourable for agriculture. The Hodder eventually joins the Ribble just downstream of Hodder Place, at an elevation of 40m AOD. The restoration works carried out as part of the SCaMP project have mainly focused on the Upper Hodder, Croasdale, Dunsop and Langden catchments.